An appetizer that has made repeat appearances among the pages of my vintage cookbook & magazine collection are cheese fondues. I like to think of my Severed Soft Pretzel Fingers & Bloody Beer Cheese Dipping Sauce as my own personal spooky twist on this mid-century party staple! 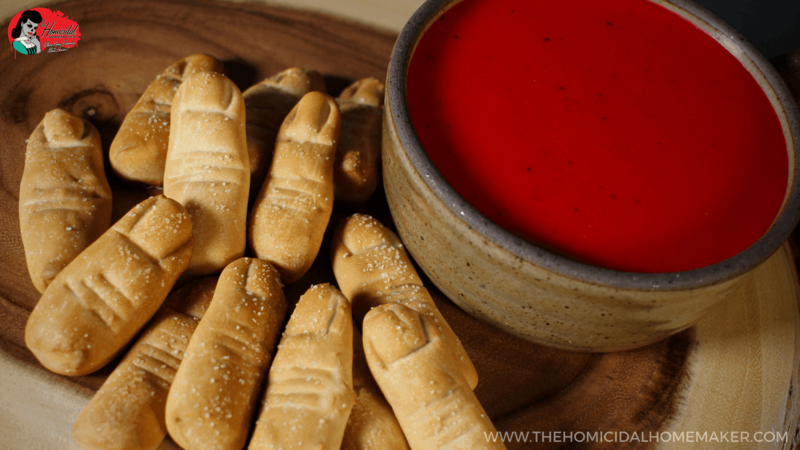 Host a Spooky Retro Fondue Party with Severed Soft Pretzel Fingers & Bloody Beer Cheese Dipping Sauce! They say the quickest way to one’s heart is through their stomach, and a cold beer paired with these Severed Soft Pretzel Fingers & Bloody Beer Cheese Dipping Sauce spiked with your favorite brew is the ultimate way to get there! Making your own soft pretzels and cheese sauce is way easier than one might think. It’s one of my go-to appetizers when enjoying beers and horror flicks with friends! If you’ve followed my blog or Pinterest boards for the past few years, then you already know that I am quite fond of mid-century food – the good, the bad, and even the utterly horrific. I’ve hosted many parties with appetizers straight out of the pages of my massive collection of 1950’s-1960’s cookbooks and magazines. An appetizer that has made repeat appearances among those pages as well as my dinner table are cheese fondues. I like to think of my Severed Soft Pretzel Fingers & Bloody Beer Cheese Dipping Sauce as my own personal spooky twist on cheese fondue. The pretzel dough is soft, malleable, and very forgiving, so it’s easy to shape it into bite-sized pieces, standard twists, or severed fingers. Don’t be scared off by all of the details on the fingers – you just need a sharp knife and a little patience. They don’t have to look perfect! When serving an appetizer that is supposed to resemble any severed body part, any imperfections just add to the look of the final dish. If you’ve never made a homemade cheese sauce, well…one bite, and you’ll never go back to the cans, blocks, frozen packages, or mixes (though, I do believe that those all still have a place in our pantries!). It comes together in just a few minutes, and you can change up the flavors by using different types of cheeses and spices. The combinations and possibilities are endless! The sauce is also delicious served with cubed bread, cured meats, pickled vegetables, and assorted crudites, and goes perfect alongside a flight or pint. Get this recipe in issue #182 (May/June 2018) of Rue Morgue Magazine, available on newstands now! In the bowl of a stand mixer, mix together the warm water and yeast. Once the mixture becomes slightly foamy, add in the flour, salt, and sugar and beat until well-combined. Knead the dough for about 5 minutes, until soft, smooth and easy to work with. Place the dough into a greased bowl, cover with plastic wrap, and allow it to rest for 30-40 minutes. Preheat your oven to 400°F. While the dough is resting, prepare the topping by combining the boiling water and baking soda, and stirring until the baking soda has dissolved. Set mixture aside to cool. Transfer the dough to a lightly-greased work surface, and divide it into eight equal pieces. Roll each piece into a 12-inch rope. Cut each rope crosswise into finger-length sections. Gently shape the dough to resemble fingers, and use a sharp knife to add ‘fingernails’ and ‘knuckles’ to each one. Once shaped, place the ‘fingers’ into the baking soda solution for a couple of minutes before transferring to a parchment-lined baking sheet. Top with coarse salt. Bake for 12 to 15 minutes, until golden brown, but still soft. Remove from the oven, and toss in melted butter. Serve with Bloody Beer Cheese Sauce. In a saucepan over medium heat, melt the butter, then add in the flour and whisk until it is a paste-like consistency; cook for one minute (this is called the roux, which is a mixture of fat/flour, and the base for rich gravies and sauces). Then add in the milk, beer, & Worcestershire sauce while stirring continuously until smooth (for those of you curious, this is a basic béchamel sauce, the base for many delicious sauces!). Stir in the red gel food coloring, mustard, garlic, and onion powders. Continue to whisk over medium heat for about five minutes. Reduce the heat to low and gradually add in the shredded cheese, stirring continuously until the cheese has completely melted. Add paprika, salt and pepper to taste. Did you make this recipe? Be sure to snap a photo and hashtag it #homicidalhomemaker for a chance to be featured!